Al Dean, “Mr. Cotton Eyed Joe,” passed away on Oct. 3, in San Antonio at the age of 85. He died from complications of cancer, and his last public appearance was in June. Al’s version of the song became a huge Texas and regional hit and many radio stations began playing it before network news breaks. Cotton Eyed Joe was even played during breaks of the San Antonio Spurs basketball games. As well, for the last 33 years, the Cotton Eyed Joe has been played during the 7th inning stretch of the Texas Rangers home baseball games. 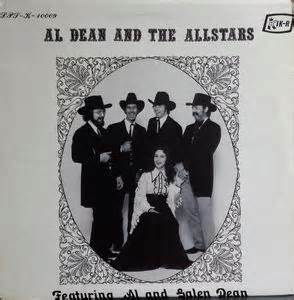 In 1987 the American Music Association awarded Al Dean the “Most Programmed Record” in the history of the Jukebox industry. In 1999, the Country Music Association of Texas inducted Al Dean into the Texas Hall of Fame. albums and popular singles, such as Casting My Lasso, Rough-Neck-Paycheck, Let’s Go Dancing, Verge of The Blues, and many others. Al developed a special straight and perfect pitch singing style with variations of beats for different styles of the Texas two-step. He also was a tremendous yodeler and could sing and yodel with the best of ’em. of 1965. As a young musician, I was totally impressed with the outstanding quality of the singing and style of playing by the talented musicians, plus they played most of the latest songs heard on country music radio stations. They also impressed me with their custom-made western suits and 5-inch brim white cowboy hats and boots. I had never seen nor heard of a country band that had a girl drummer. She could even play a solo on a fast song called Draggin’ the Bow. That drummer turned out to be Maxine Dean, Al’s wife and the mother of sons, Galen and Gary Dean. Al had worked as an oilfield supply salesman since high school to support his family and his music/singing sideline. In 1974, he made the decision to go full time in the music business due to the popularity of his music and successful record sales. my predecessor was the late Ray Smith, a very talented musician and long-time Allstar. My career with the band ended in 1978 when accepting a shift-work job at a local refinery. I continued to play special events with the band up until a few years ago when I began my DJ services (Dancehall Sounds). As an Allstar, I was very fortunate to play dances at Schroeder Hall in Goliad, The Winchester Club in Houston, Alice VFW, the Stampede Club in Big Spring, internationally famous Farmer’s Daughter Club in San Antonio, and many other dance halls throughout the state of Texas. I also had the opportunity to travel to Nashville when Al and Galen recorded in studio B at RCA Records, where I met Buddy Emmons, Buddy Spicher, Dave Kirby, Jimmy Capps, and many other famous Nashville musicians. I also had the honor of playing steel guitar on the entire album, On The Bandstand recorded in Houston, for the Glad Music record company. Allen will DJ a special tribute dance to Al Dean on Sat., Nov. 12 at the Gallagher Ranch Barn Dance, 1020 FM 1540 in Sandia, from 6-11 pm. Bring your own lawn chairs, snacks, and drinks. Call 361-813-8817 for information.